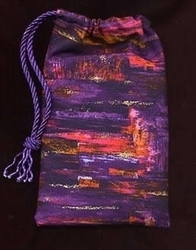 Short Bags - Perceptions Rune Bag - Tarot Bags, Tarot Cards, Cloths, & More! Like artist brush strokes of purple, azure, magenta, gold, and black, the colors of this fabric create a stunning pattern of lines and shapes. These brush strokes are wonderful matches to the colors used in numerous popular tarot decks. Size: Short, approx. 5 x 6 inches. 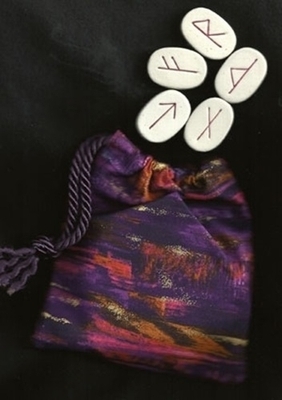 Fits runes set or mini or pocket tarot decks.